Imagine if there was a “Kickstarter for people” where you could support up-and-coming artists, developers, entrepreneurs — when they need the cash the most, and most importantly, you’d only profit when they profit. Imagine if you could diversify by pooling 1% of your future income with your ten smartest friends. Now think about how much you’d go out of your way to help, say, your brother-in-law or step-siblings. Probably much more than a stranger. Why is that? To pose a thought experiment: If you didn’t know your cousins were related to you, you might treat them like any other person. But because we have this social context of an “extended family,” you have a sort of genetic equity in them — a feeling that your fates are shared and it’s your responsibility to support them. This begs the question: How can we create the social context needed for people to truly care about others outside of their extended family? If you believe that markets and trade have helped the world become a less violent place — because why hurt someone when it’ll also take money out of your pocket? — then you should believe that adding more markets (with proper safeguards) will make the world even less violent. This is the hope of income share agreements (ISAs). ISAs align economic incentives in ways that encourage us to help others beyond our extended family, give people economic opportunity who don’t have it today, and free people from the shackles of debt. What are these ISAs you speak of? An Income Share Agreement is a financial arrangement where an individual or organization provides something of value to a recipient, who, in exchange, agrees to pay back a percentage of their income for a certain period of time. In the context of education, ISAs are a debt-free alternative to loans. Rather than go into debt, students receive interest-free funding from an investor or benefactor. In exchange, the student agrees to share a percentage of future income with their counterparty. They come in different shapes and sizes, but almost always with terms that take into account a plethora of potential scenarios. - Mark Kantrowitz, a leading national expert on student loans who has testified before Congress about student aid policy. There is a long and storied history of income share agreements, but they’ve only recently become popular due to the rise of Lambda School, a school that lets students attend for free and, if they do well after school, pay a percentage of their income until they pay Lambda back. Wait, a popular meme sarcastically asks, did you just invent taxes? No. Lambda only gets paid if and only if the student earns a certain amount after graduation. In other words, incentives are aligned. The student is the customer. Not the government. Not the state. Not the parents. To be sure, it’s early days for ISAs: Adverse selection, legalization, concerns about individuals being corporations (derivatives? Shorting people?!) — there’s a lot left to figure out. Still, it’s an idea that once you see, you can’t unsee. Picture Janet, a Senior at Davidson High School. She has a 4.0 GPA, is captain of the debate team and star center forward of the Varsity Soccer team. She’s a shoo-in for a top 20 university, but her parents can’t afford it even with a scholarship, so she’s not even going to apply, and is headed for State. Then she learns from a news article that she’s a pretty good bet as someone who’s going to succeed down the road, and that might allow her to put some much needed cash towards her education. She goes for it, makes a profile on an ISA, and sure enough, a few strangers bet $50,000 on her college education! She immediately gets to work filling out Ivy League scholarship applications. Throughout college, she keeps in touch with her investors, they give her advice, and because of her interest in politics, one even helps her get an internship with a governor’s election campaign over the summer. Once she graduates, she knows the clock is ticking — at 23 she’ll need to start paying back the investors 5% of her after tax income, so she hustles to work her way through the ranks. The above is purely hypothetical. ISAs for traditional higher education are much more complicated than say, vocational training, where there is more direct alignment of ‘skills-development-to-job’ pathway for students. But, the beauty of ISAs is in their flexibility, so there is lots of room for innovation. So: this is the dream — why hasn’t it happened yet? In modern times, the first notable mention of the concept of ISAs was by Nobel-prize winning economist Milton Friedman in his 1955 essay The Role of Government in Education. In a section devoted specifically to vocational and professional education, Friedman proposed that an investor could buy a share in a student’s future earning prospects. Society might not have been ready for ISAs in the 1950s, but 16 years later, another Nobel Prize-winning economist, James Tobin, would help launch the first ISA option for college students at Yale University. In the 1970s, Yale University ran an experiment called the Tuition Postponement Option (“TPO”). The TPO was a student loan program that enabled groups of undergraduates to pay off loans as a “cohort” by committing a portion of their future annual income. Students who signed up for the program (3,300 in total) were to pay four percent of their annual income for every $1,000 borrowed until the entire group’s debt had been paid off. High earners could buy out early, paying 150% of what was borrowed plus interest. Within each cohort, many low earners defaulted, while the highest earners bought out early, leaving a disproportionate debt burden for the remaining graduates. Administrators also did not account for the changes to the tax code and skyrocketing inflation in the 1980s, which only exacerbated the inequitable arrangement. “We’re all glad it’s come to an end,” It was an experiment that had good intentions but several design flaws.” — Yale President Richard Levin. While the TPO is generally considered a failure, it was the first instance of a major university offering ISAs and a useful example for how not to structure ISAs — specifically, pooling students by cohort and allowing the highest earning students to buy out early. 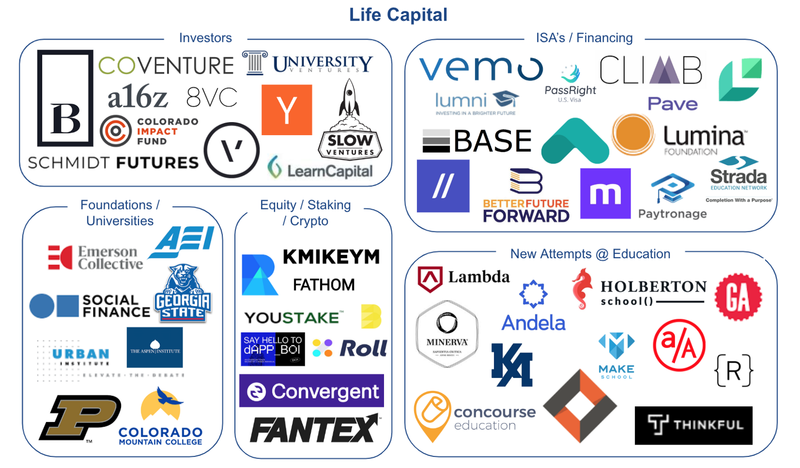 It would be decades after Yale’s failed experiment before universities started experimenting again with ISAs, but today a company called Vemo Education is leading the way. This is a crucial point: Vemo isn’t competing directly with loans, but instead is unlocking other sorts of value (i.e., helping students better choose their college). The key here is that Vemo links an individual’s fortunes to the institution’s fortunes. The company helps universities signal value to students by helping them offer ISAs that signal that the university wants to better align cost with value of its higher education program. The first company that Vemo partnered with to offer ISAs was Purdue University. In 2016, Purdue University began partnering with Vemo Education to offer students an ISA tuition option through its “Back a Boiler” ISA Fund. They started with a $2 million fund, and since then have raised another $10.2 million and have issued 759 contracts totaling $9.5 million to students. Purdue markets its ISA offering as an alternative to private student loans and Parent PLUS Loans. Students of any major can get $10,000 per year in ISA funding at rates that vary between 1.73% and 5.00% of their monthly income. Purdue caps payments at 2.5x the ISA amount that students take out and payment is waived for students making less than $20,000 in annual income. In the last few years, Vemo has emerged as the leading partner for higher education institutions looking to develop, launch and implement ISAs. In 2017, Vemo powered $23M of ISAs for college students across the US. Fintech company Upstart initially launched with a model of “crowdfunding for education”. However, they eventually pivoted to offering traditional loans when they realized that their initial model was simply not viable. The fact that only accredited investors (over $1m in net worth) could invest severely limited the total potential funders on the site. And yet, while Upstart never got enough traction (they pivoted successfully), they paved the way for a platform like it to eventually be built. While Upstart failed to gain traction, technical educational bootcamps have seen tremendous growth while offering their students ISAs to finance their education. And Lambda School is leading the way. Lambda School is an online bootcamp that trains students to become software engineers at no upfront cost. Instead of paying tuition, students agree to pay 17% of their income for the first two years that they’re employed. Lambda School includes a $50,000 minimum income threshold and caps total payments at an aggregate $30,000. They also give students the option to pay $20,000 upfront if they’d rather not receive an ISA. Lambda School students enroll for nine months and end up with 1,500–2,000 hours of training, comparable to the level of training they’d receive during a CS-focused portion of a four-year CS degree. “Lambda School looks like a charity from the outside, but we’re really more like a hedge fund. In our opinion, Lambda is legitimizing ISAs and may just be the wedge that makes ISAs mainstream. Given where we are today, and with the potential for this type of financial innovation, what might the future look like? There are three major themes in particular that get us excited for the future of ISAs: aggregation, novel incentive structures, and crypto. We believe that it’s possible to pool together various segments of people to decrease overall risk of that population and provide more to each individual person. If we assume that each individual is fairly independent from each other, this should be a possibility. As risk declines, your expected return should increase. And as your expected return increases, more investors and ISA providers will likely jump in to provide even more capital for more people. Another take on aggregation could be an individual electing to group together with their close friends or peers. This can have the magical benefit of further aligning incentives with those around you, increasing the value of cooperation, lowering downside risk, and promoting more potential risk taking or thinking outside the box, all of which should have the benefit of increasing economic growth. In addition to that, being able to take a more active role in a friend’s life (helping when need be, sharing in their wins, supporting in their losses, etc.) can be an extremely rewarding experience. That said, there are some definite downsides and risks to be aware of with these types of arrangements. How can we create financial products to incentivize service provides (i.e. teachers, doctors, etc.) where they are indirectly having massive impacts to income from future generations? Just imagine if every teacher was able to take even just a tiny percentage of every one of their students’ future earnings the difference that tweak could make. Teachers today unfortunately don’t make nearly as much money as they should given the significant consequences they have on future generations. A great teacher can create the spark for the next Einstein or Elon Musk. A terrible teacher could damage the potential Einstein or Elon Musk enough where they never realize their potential. Imagine how many more incredible people we could have. There will always be incredible teachers regardless of monetary return, but we bet there could be more. It all comes down to aligning incentives. This same thinking can be applied to other service providers like doctors. Currently, doctors are paid the same amount (all else equal) whether they succeed or not in a life-saving surgery. But what if the service provider also took a tiny fraction of future earnings from their patient? Incentives are more aligned. That doctor may not even realize it, but they likely would work a bit harder knowing what’s at stake. Crypto can securitize so much more than we currently do; in essence, we could tokenize ourselves and all future income. Once those personal tokens exist, they can be traded instantly anywhere on the world with infinite divisibility. Arbitrageurs and professional traders could create new financial products (i.e. ISA aggregations) and buy / sell with each other to price things to near perfection. We’d love to continue the conversation! This is a fascinating space with a ton of opportunity. If you’re thinking about or building anything here, feel free to leave your comments or reach out to talk more. Special shoutout to David Weinstein & Jake Hallac for their help writing as well as Ray Batra, Dani Grant, Zander Adell, Dave McClure, Sam Lessin and Alex Marcus for their help reviewing / editing! Isn’t giving up the legal right to a portion of future income equivalent to modern-day indentured servitude? Quick refresher: Indentured servants were immigrants who bargained away their labor (and freedom) for four-to-seven years in exchange for passage to the British colonies, room, board and freedom dues (a prearranged severance). Most of these immigrants were English men who came to British colonies in the 17th century. On the surface this seems like a decent deal, but not so fast. They could be sold, lent out or inherited. Only 40% of indentured servants lived to complete the terms of their contracts. Masters traded laborers as property and disciplined them with impunity, all lawful at the time. Rebuttal: We are in no way advocating a return to indentured servitude (voluntary or otherwise). Modern-day ISAs must be structured to have proper governance, ensure alignment of interests and contain legal covenants that protect both parties. We are advocating for ISAs that (i) are voluntary, (ii) do not force the recipient to work for the investor, and (iii) are a promise to share future income, not an obligation to repay a debt. ISAs are unregulated. How do we structure and enforce ISAs without a legal framework to rely on? Our Response: ISAs offered by Lambda School, Holberton School and other companies are legal under current US law. To the best of our knowledge, all companies offering ISAs operate according to best practices (i.e., consumer disclosure and borrower protections) as set forth in proposed federal legislation. The Investing in Student Success Act (H.R.3432, S.268) has been proposed in both the US House of Representatives and the US Senate. Under this legislation, ISAs would be classified as qualified education loans (rather than equity or debt securities), making them dischargeable in bankruptcy. Furthermore, the bill would exempt ISAs from being considered an investment company under the Investment Company Act of 1940. Importantly, the bill includes consumer protections (i.e., required disclosures, payback periods, payback caps, and limits on income share amounts). The bill also includes tax stipulations that preclude ISA recipients from owning any taxes and limiting taxes for investors to apply to profits earned from ISAs. Given that ISAs are riskier than student loans, but don’t require the same qualifications, aren’t ISAs prone to adverse selection? Quick refresher: Adverse selection describes a situation in which one party has information that the other does not have. To fight adverse selection, insurance companies reduce exposure to large claims by limiting coverage of raising premiums. Our Response: In September 2018, Purdue University published a research study that looked into adverse selection in ISAs. The study concluded that there was no adverse selection by student ability among borrowers. However, ISA providers need to properly structure the ISA so as not to cap a recipient’s upside by too much. In addition, this risk can be mitigated by (i) offering a structured educational curriculum for high-income jobs and (ii) an application process that ensures that students have the ability and motivation to complete a given vocational program. Couldn’t ISAs result in lack of diversity and discriminatory practices? Our Response: Properly structured ISAs paired with effective offerings (i.e., skills-based training, career development assistance) have the potential to mitigate inequality and discriminatory practices. ISA programs like Lambda School require students to be motivated to succeed and have enough income to complete the program, but in no way discriminate based on age, gender or ethnicity. However, as ISAs become more common, new legislation must include explicit protections to guard against discrimination in administration of ISAs (especially given that it’s unclear whether the Equal Credit Opportunity Act would apply to ISAs since they aren’t technically loans). Can’t students simply refuse to pay once they start earning income after graduation? Our Response: ISA providers like Lambda School are already starting to negotiate directly with employers to ensure that students have a job after completing the curriculum. These relationships mitigate the risk of a student refusing to pay. Lambda School is able to do this because it’s developed such a strong curriculum. Furthermore, students face reputation risk should they try to avoid meeting their obligations to the ISA provider. Future legislation should address instances where a student avoids payment or chooses to take a job with no salary (i.e., a student completes a coding bootcamp, but has a change of heart and goes to work at a non-profit that pays below the minimum income threshold. Equity is expensive (relative to debt), so wouldn’t students be better off sticking with traditional debt financing? Our Response: ISAs are not for everyone. ISA’s are best suited for people with greater expected volatility in their future earnings (instead of people with a strong likelihood of a certain amount of salary). This is similar to new businesses choosing between equity investment vs. debt to finance their operations. Businesses with clear expectations of future cashflows generally benefit more from debt vs. equity. Individuals looking to finance their education are no different. Similarly, ISA’s don’t need to be all or nothing. Individuals can choose to capitalize their education with a mix of student loans + ISA’s to get a more optimal mix.